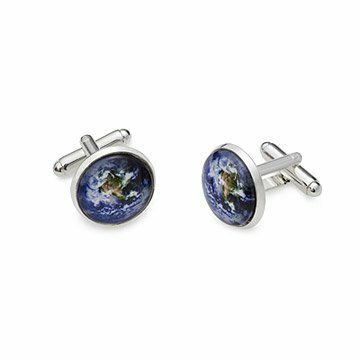 These unique cufflinks feature detailed images of the "pale blue dot" we call home. His look was spiffy but always down to earth. A sartorial celebration of planetary pride, these unique cufflinks feature detailed images of the "pale blue dot" we call home. The tiny terrestrial portraits are set under glass on silver-toned cufflinks, making a great gift for guys with stellar style. Handmade by Lauren Beacham in Maryland. use a soft, dry cloth. Item is individually handmade and not waterproof. Please avoid getting your accessory wet. As my Husband is a cuff link collector, I thought that these inexpensive, yet stylish and creative cufflinks would be a great gift for our wedding day. I wrote him a romantic letter explaining all the reasons I thought we were perfect for each other and how lucky we are to have found one another in this crazy world of 7.3 billion people on earth. When the cufflinks arrived I was super disappointed when I opened the box. I was hoping for vivid blue colors and shiny silver metal, but they were nothing like that. The "picture" of earth (not even sure if it's a true photo) or just a cheap print out off the internet, is blurry, grainy and dull. The silver was tarnished and looked/felt cheap. My husband would not appreciate these and sadly I returned them. I still have the note and have been trying to find the perfect time to give it to him.